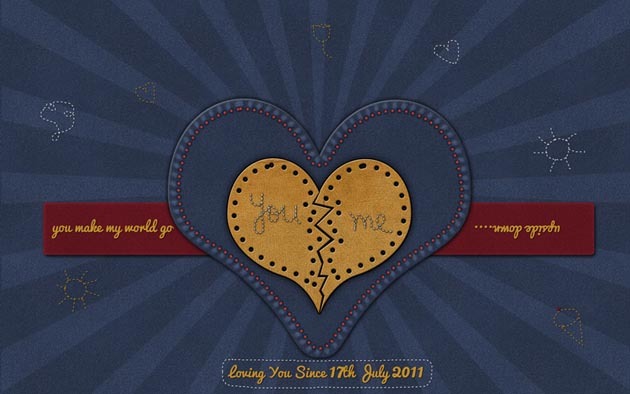 Hopefully you will learn new things from this Valentine Photoshop tutorial and decide to download the free wallpaper. And I also hope you will share it with all your friends. 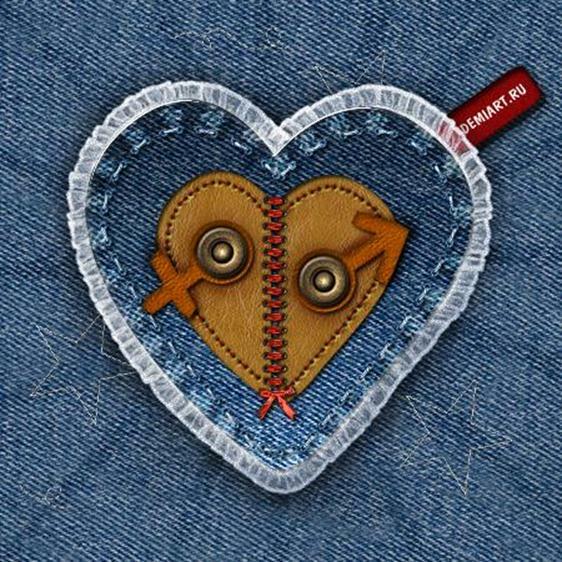 Here is what we are about to create, a nice jeans heart with stitch brushes and leather texture. 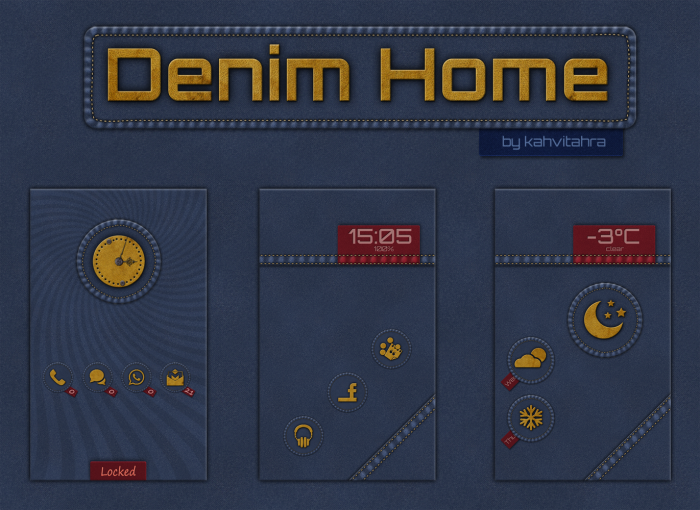 If you like jeans and fabric inspired tutorials you can check out this tutorial. Because I am making a Valentine Day Wallpaper I have to take into account the wallpaper size before I begin. As you know there are many different resolution sizes, for example 1600x1200, 1920x1080, and so on. Usually, when I make a wallpaper, I create it at 1920x1200 px size. That way, since most people's resolutions are that size or smaller, the wallpaper comes out looking good. It's always better to shrink it than to try and stretch it. Another trick is to use a seamless pattern for the background and to blend the other images with this background, so that if you need a bigger image you can easily add extra pixels. I will use this trick in my Valentine Day Photoshop tutorial. Call the first layer Denim Background and fill it with any color you want. I will make a denim background using these Jeans Patterns so load them into your Photoshop. 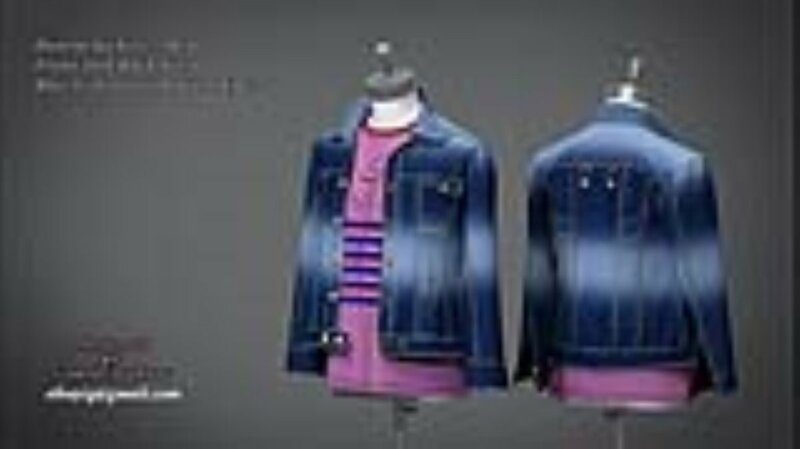 Open the layer style window and add Pattern Overlay using the Jeans Dark Wash pattern. Create another layer and add a Sunburst using these Sunburst Brushes. Use the color white to make the Sunburst right in the center of the image. Resize it to cover the entire canvas. Now change the Blending Mode of this layer to Overlay 10% to obtain a more softer look. 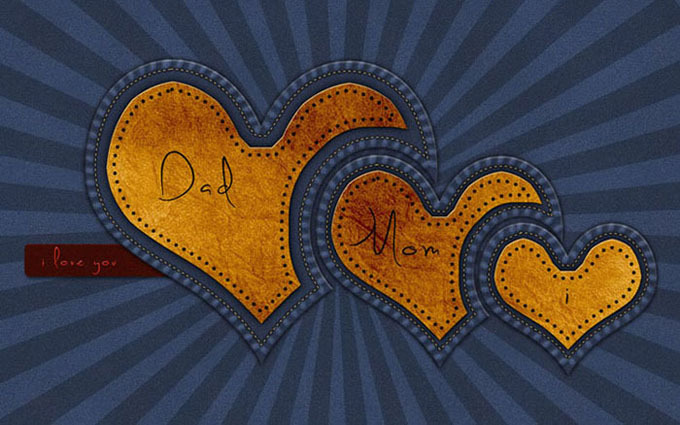 Download these Heart Custom Shapes and draw a simple heart shape in the center of the image. Make sure you have the Paths selected. With the Convert Point Tool click and drag the anchor point. Without letting go, move the mouse around to obtain a curve. The line that is created is called the Tangent Line. Select the Path Selection Tool, right click and choose Make Selection like shown in the image. Add a new layer and add it Clouds Filter using #373a3e and #84898d as Background and Foreground colors. Set the blending mode of this layer to Color Dodge 17%. A higher opacity will give you a lighter denim color so it is you choice how you want to look like in the end. As I told you earlier it's not my intention to show you how to create a denim texture from scratch but this step requires some jeans related effects. 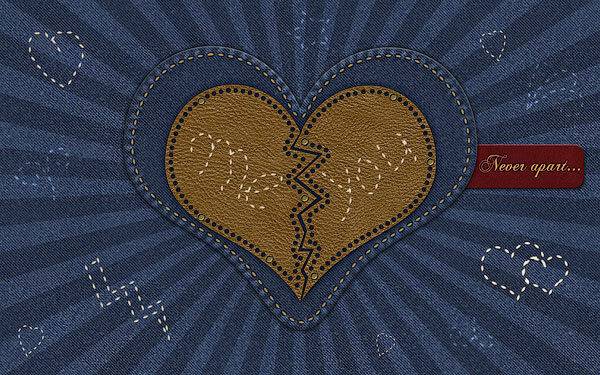 I am talking about stitch effect and fabric folds around the edges of our new created Denim Heart. Let's start creating some fabric folds using a simple custom made brush. You can find it in my resources ZIP pack . 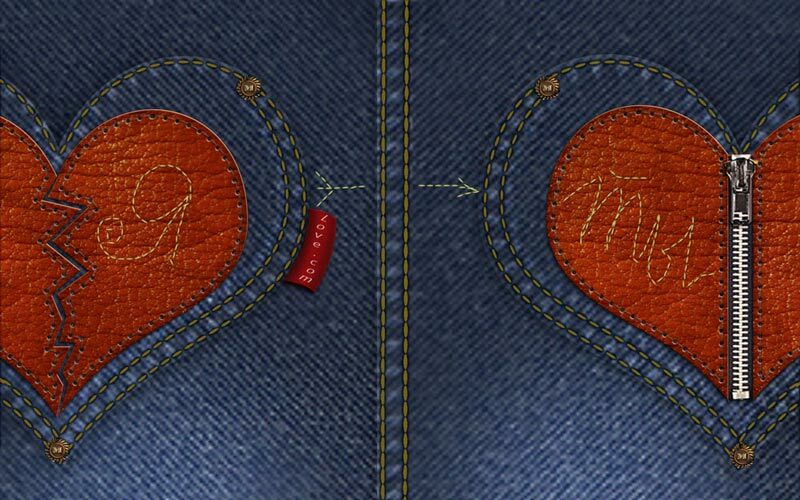 Select the Denim Heart layer shape and go to Select Menu, Modify, Contract with 12 px. Set the blending mode to Overlay 60% and add some layer styles like shown in the image. Load the Stitch Brush that you'll find in the same Zip resources file. Create a new layer above all the other layers and call it Stitch Effect. Select the Heart Shape and Contract the selection by 22 px. Make Work Path from this selection. Set the Foreground color #c8932e. Select the Stitch Brush for the Brush Tool and go to Paths Tab. Right Click on the Work Path and choose Stroke Path. Use the Rounded Rectangle Tool to create a label. Call this layer Fabric Label and place it below the Denim Heart Layer. Open the Layer Style Window and add Drop Shadow, Inner Shadow and Pattern Overlay. By the way, the most important thing is to set the color of the label #9b3232. The Pattern Overlay used is the same Jeans Dark Wash pattern used in the first step. I wrote my website name "psd-dude.com" using the Segoe UI free font. Set the Blending Mode to Color Dodge 100%. 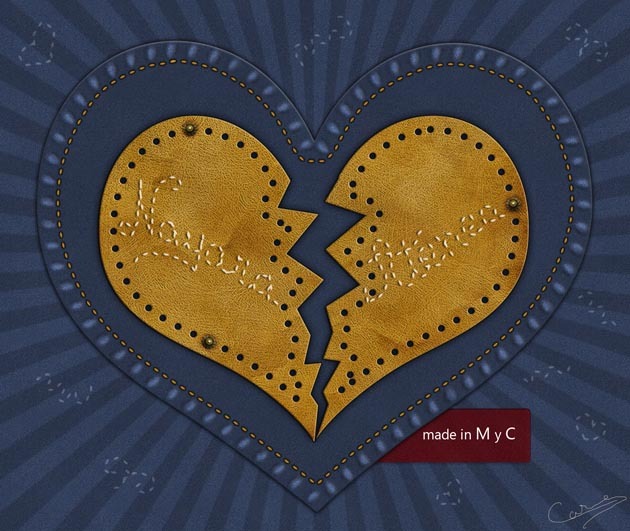 To make this heart label I will use a leather texture . I picked from the list this beautiful free leather texture but you can of course choose another one. Copy the texture into Photoshop. Change the color by adjusting the Hue/Saturation balance. Make sure you check Colorize. 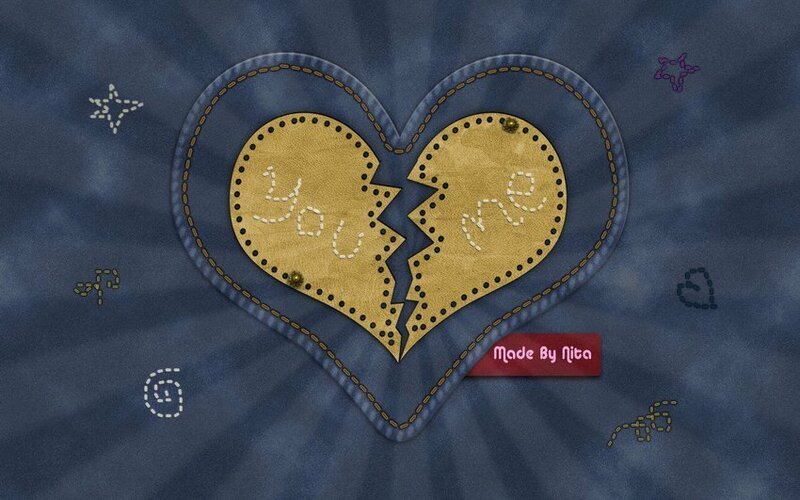 Open the Heart Custom Shapes list and add this broken heart shape using Paths. Make a Selection out of this shape. Press CTRL+J to make a Layer via Copy extracted from the Leather Texture Layer. Set the Dotted Brush for the Eraser Tool. You will find this brush in the ZIP resources file. 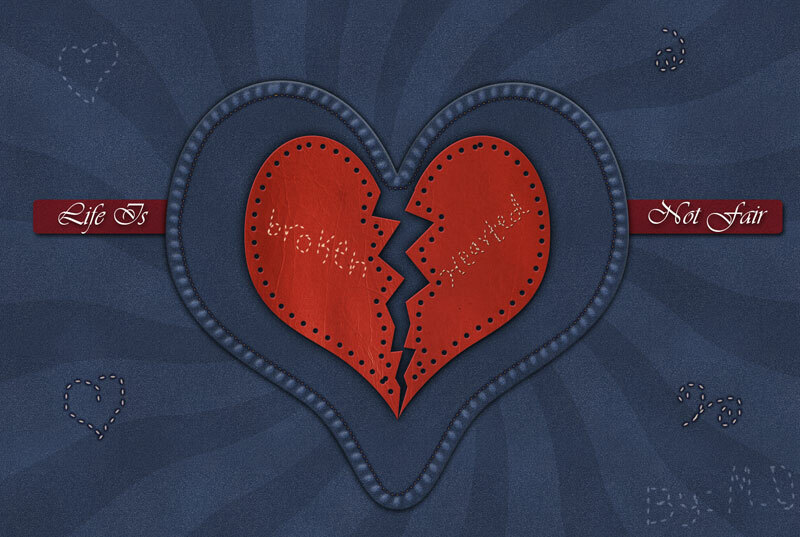 Select the Broken Heart Shape and Contract it by 17 px. Transform the selection into a Work Path and Stroke using Eraser Tool. Depending on the size of your heart shape you will have to adjust the size of the Dotted Brush and the Spacing between dots, otherwise your result might not look so good! To make the leather look more realistic and beautiful I decided to add it an extra texture. So in another layer copy an Old Paper Texture. Select the Leather Heart Shape and add it as Layer Mask to the Old Paper Layer. Set the Blending Mode of the Old Paper Layer to Multiply 100%, You can adjust the Brightness and Contrast Balance to obtain the best result. Create a new layer and call it Handwriting Layer. Use the Stitch Brush to write by hand a text on the Leather Heart. Use the #ffeace color for the brush and also add a Drop Shadow effect, 1px shadow and distance. For the final touches I decided to use some small details using the Stitch Brush. 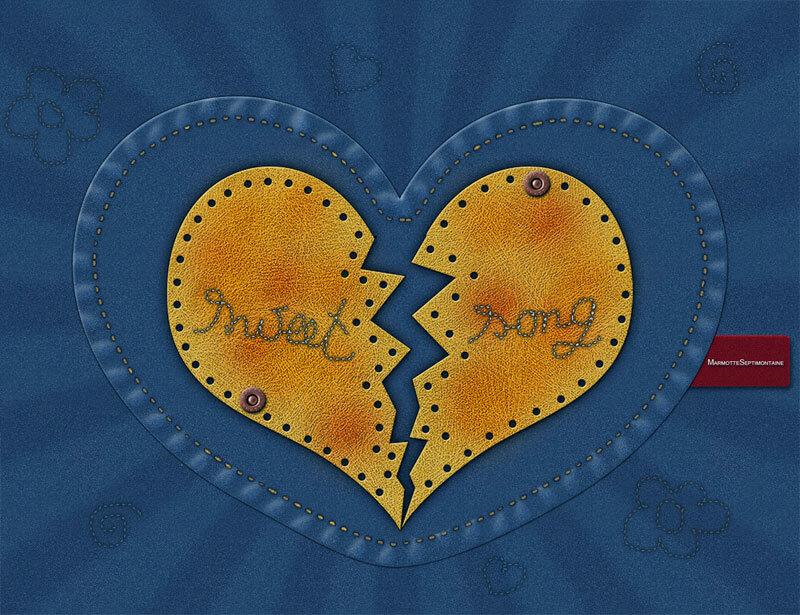 Using freehand drawing, add small hearts and swirls made in doodle style. I added this details in Handwriting Layer, in Stitch Effect Layer and a new created layer Stitch Overlay. In this new layer use a the color white for the brush and Overlay for the Blending Mode of the layer. 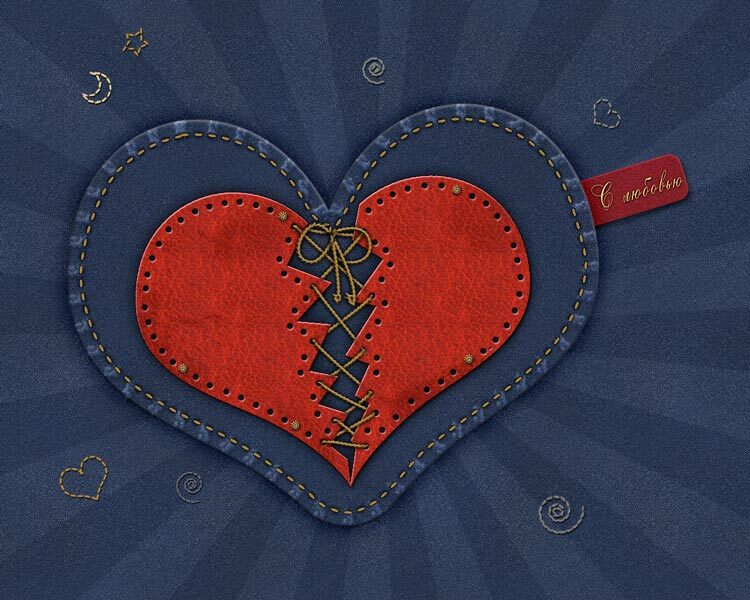 Here is the final result for the Valentine Photoshop Wallpaper with Jeans Heart, I really hope you like it. In just a few days we will give you the free wallpaper for desktop and iPhone, just in time for Valentine's Day! 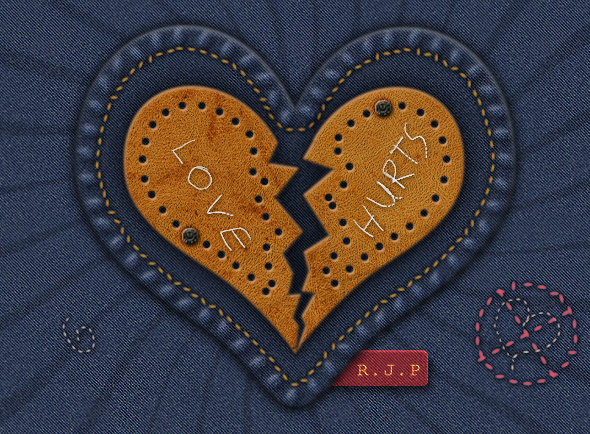 43 comment(s) for "Valentine Photoshop Wallpaper with Jeans Heart"
thanks for this awesome tutorial.. i modified it a bit to my liking as i didnt like the "broken" heart concept... thanks again..the tutorial was easy to follow. I am glad you liked the tutorial...your result looks great, I love the message you have added ("you make my world go upside down" :)) and all the other details! About the buttons I have forgot to mention that I have taken hem from this image. Simply crop the buttons, add a little shadow around them where they meet the leather surface, and that is all! I am glad that I have found this tutorial. My favourite style is the jeans&country style. This is a very nice tutorial for me. Thanx again!!! When I create the own image I will send it to you. I really like the result, looks nice but you have to pay more attention to details to make everything look even better. For example the stitch brush with that outline doesn't look to realistic. Merci encore une fois de partager vos cr? ?ations et de nous permettre de les r??aliser. Hooo! merci c'est tr? ?s agr? ?able de lire ce compliment surtout pour une auto-didacte. Chaque jour je d? ?couvre un peu plus les possibilit? ?s de cr? ?ations offertes par Photoshop.... Et c'est gr? ?ce ?? des personnes qui comme vous prennent le temps de tenir un blog explicatif. Alors oui, j'appr? ?cie votre travail ?? sa juste valeur. 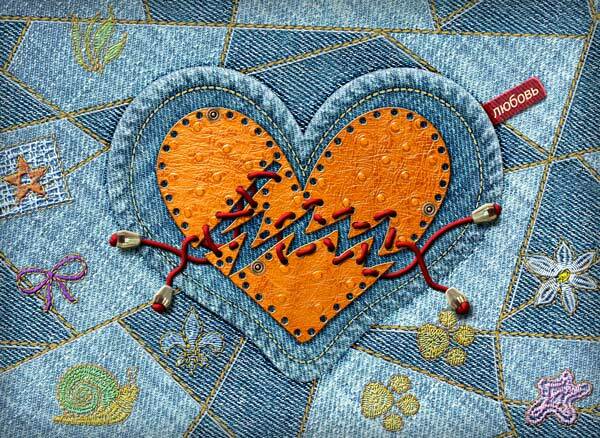 Wow it seems that this tutorial is really popular, here is yet another cool result, a stitched denim heart with leather and lace ... beautiful! Thank U very much for this very good tutorial, as new bee in photoshop it took me 6 hours to learn , once understood the concept it became easy to understand. This is old post but thanks for this awesome tutorial. I made couple years back android home and lock screen, thanks to this tutorial. Here's link to that and thanks for your great work!